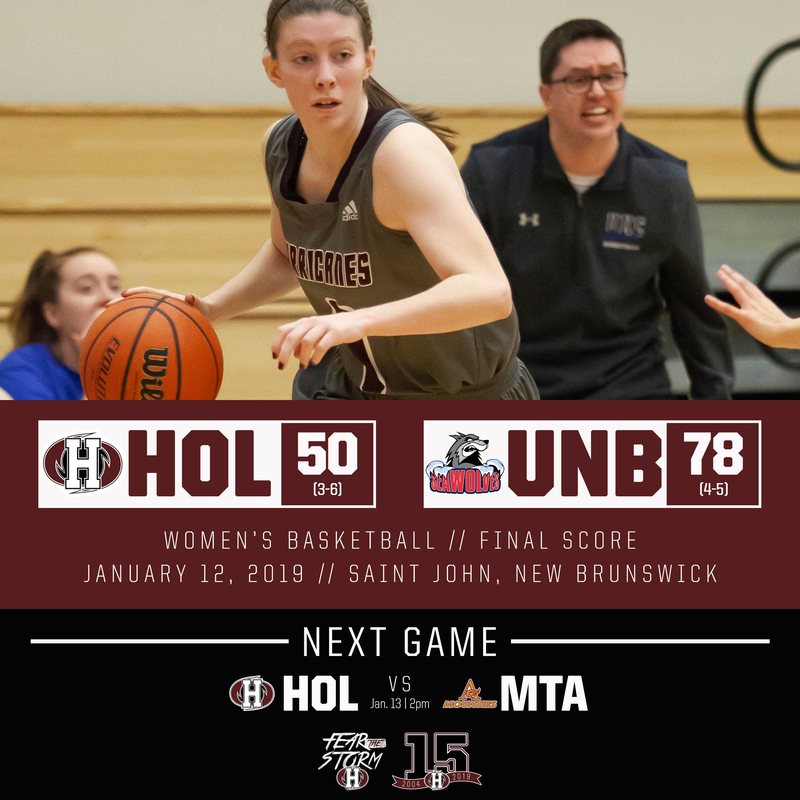 The Holland Hurricanes men’s and women’s basketball teams faced the UNBSJ Seawolves and Mount Allison Mounties this weekend; the men would go on to win both of their games while the women were on the losing end twice. 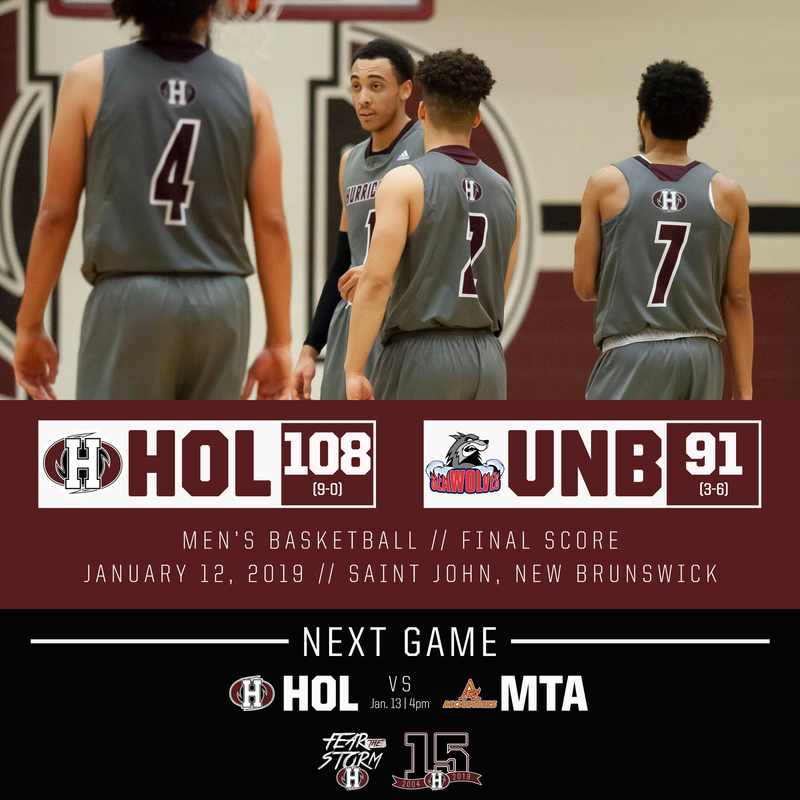 Saturday’s games were played in Saint John while Sunday’s took place at the Holland College Centre for Community Engagement in Charlottetown. On Saturday versus the Seawolves, the men’s ‘Canes held a slim 27-22 lead at the end of the first quarter, but would use a strong second quarter to take a 60-42 lead at the half. The game would tighten up in the second half with the Hurricanes ultimately winning 108-91. Seven players scored in double figures for Holland College on Saturday, led by Jace Colley who had 19 points, 12 rebounds, and four assists. Jordan Holness would score 17 for the Hurricanes, while Connor Therrien had 16, and both Roosevelt Whyley and Martin Campbell had 13 each. Whyley added seven rebounds, two steals, and a block with Holness adding four rebounds, four assists, and five steals. Cam Paynter and Travis Adams came off the bench to score 15 each. On Sunday versus the Mounties, the Hurricanes came out of the gates strong and opened a 32-13 lead after one and a 58-27 lead at the half. The Hurricanes would ultimately earn the victory by a score of 103-81. Colley once again led the offense for the ‘Canes with 24 points along with five rebounds, three assists, one steal, and two blocks. Campbell and Adams both had 20 points with Holness adding 18 and Agak Lual chipping in with ten off the bench. Adams added 11 rebounds for the double-double along with three assists and six steals. Holness had four rebounds, six assists, and five steals while Lual had five rebounds, three steals, and six blocks. With the two victories the ‘Canes improve to 10-0 on the season and continue to lead the ACAA standings. The UNBSJ Seawolves now sit in a tie for fifth place with a 3-7 record while the Mounties are in fourth, now sitting at 6-4. In the women’s game on Saturday versus UNBSJ, the ‘Canes and Seawolves were tied 14-14 after one with UNBSJ stretching their lead to 40-26 at the half. The Seawolves would earn the victory by a score of 78-50. Desiree Oakley had a game-high 18 points to lead the way for the ‘Canes with Ashley Plaggenhoef adding 12. Oakley added six rebounds and four steals with Kassandra Little also pulling in six rebounds. On Sunday against the Mounties, the ‘Canes lead 12-10 after the first quarter but the Mounties would rebound and pull ahead 25-16 at the half. 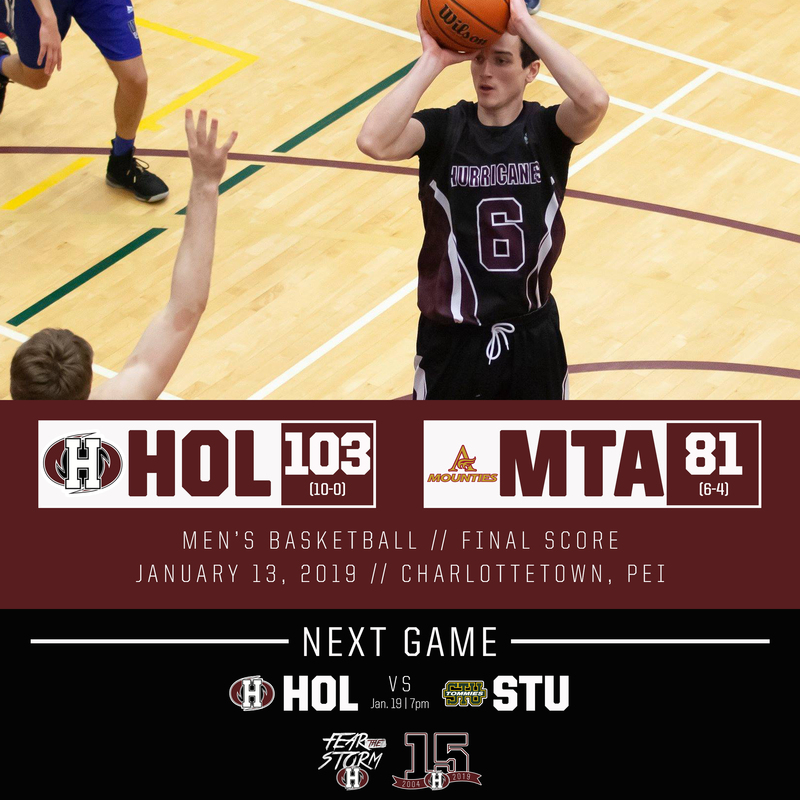 Mount Allison would cruise to the 71-43 victory as the final buzzer sounded. Lexi MacInnis had a double-double to lead the way for the ‘Canes with 13 points and ten rebounds while Little also had ten rebounds in the loss. The ‘Canes fall to 3-7 on the season after the two weekend losses and are tied for sixth place in the ACAA standings. The UNBSJ Seawolves are in fifth with a 4-6 record while the Mounties are in third place at 7-3. 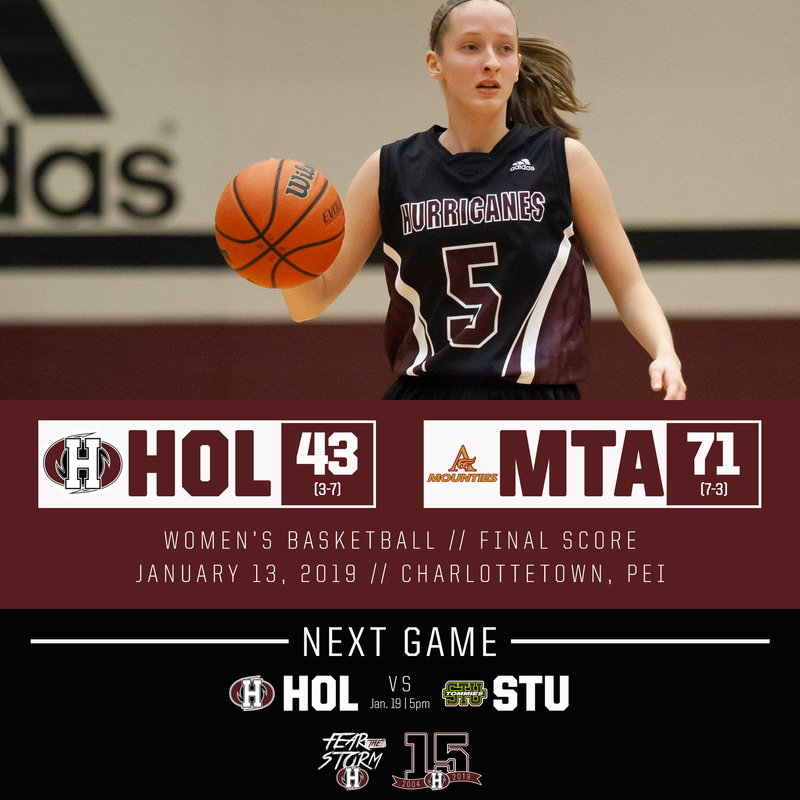 The men’s and women’s Hurricanes will return to action next weekend, first hosting the STU Tommies on Saturday before welcoming the Crandall Chargers to Charlottetown on Sunday; all games take place at the Holland College Centre for Community Engagement. To connect with the basketball Hurricanes please visit www.twitter.com/caneswbball and www.twitter.com/canesmbball.